Hi there it's Anja again on this lovely monday the end of februari and the beginning of march. I wanted to use several leaves and highlight them in some way in a panel and make that pop. So I did some watercolor washing, some clear embossing and masking. I used a lila topfolded cardbase and cut a watercolor paper panel slightly smaller then the cardbase. I positioned the framedie and taped the edges to stamp the images in the middle. The stamping was done with some maskingpaper. After this stamping I stamped the image at the side with some watermark ink and clear embossingpowder and did some watercolorwashing with distress ink. I diecut the frame and placed it back with some foamtape to give it extra dimension. The word thanks was stamped and fuzzy cut and the sentence was stamped with white embossingpowder on a lila strip. To finish the card I used some clear droplets. 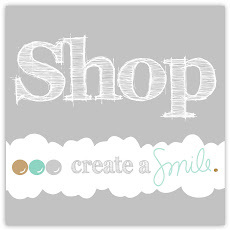 Have you seen all those pretty sequins and clear droplets from pretty pink posh you can order over at create a smile? and those great acrylic blocks which make it some much easier to stamp? A Card Without Any Images - Rainbow Fun! To make a fun card without involving any images. As you can see, I basically almost filled the background with the colours of the rainbow. As usual, I use Distress Ink for this. You can use any medium you have. Hey! You can even use strips of cardstock to create a rainbow background. Today I have another card for you using the Set Made of Snow but this time for a Christmas card. After last week's card I couldn't stay away from this cute set. As I challenge myself to make two Christmas cards each month I decided to use the cute deer this time. If you add Glossy Accents to your baubles you can easily add a little bit of shimmer by sprinkling a little bit of glitter on it. If you have a small image, place it on a die cut to make it stand out. Making Christmas cards all over the year helps reducing the stress in already busy December. 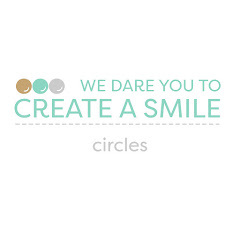 Follow Create a Smile on Facebook and Instagram to get all the news! I can't stop using the floral sets that Christine creates! These are some of my FAVORITE sets ever, and honestly, I'm not a flower person!! Well, I guess I can't say that anymore...I *used* to not be a floral person...what's next...? Purple?! Ha! 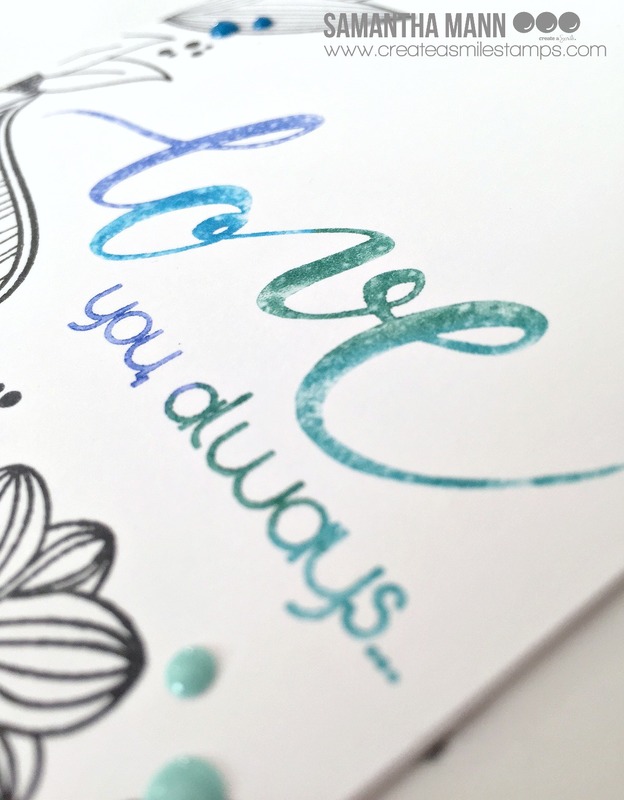 To create this card, you'll definitely need some Distress Markers! - using the Distress Markers, color directly onto your stamps! I used four different colors (Chipped Sapphire, Mermaid Lagoon, Pine Needles and Peacock Feathers). - then stamp directly onto your card front! 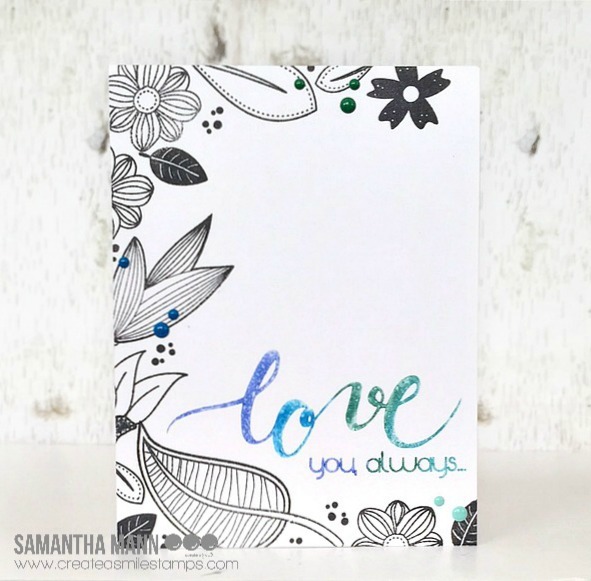 - once the sentiment was stamped, I stamped with various leaves and flowers along three of the edges of the card, keeping it in black and white, so the focus stays on the sentiment. - to finish the card, I added some enamel dots! I used enamel dots from various collections (Fruitalicious, Holly & Berry and Sending Sunshine). The sentiment is from This Must Be Love and the flowers/leaves are from Botanical Love and Time to Say Thanks. Thanks again for spending some of your time with me this Friday! I am here with youtoday to share something AMAZING. 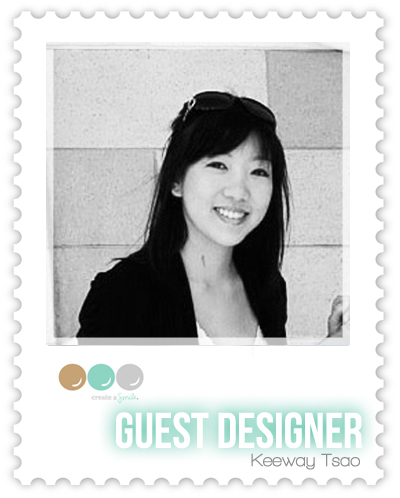 When we had out last Guest Designer Call I was happy to see Keeway Tsao apply - I had followed her INstagram for a while and each and every creation she makes it outstanding, unique, clever, perfecly executed and cheerful. 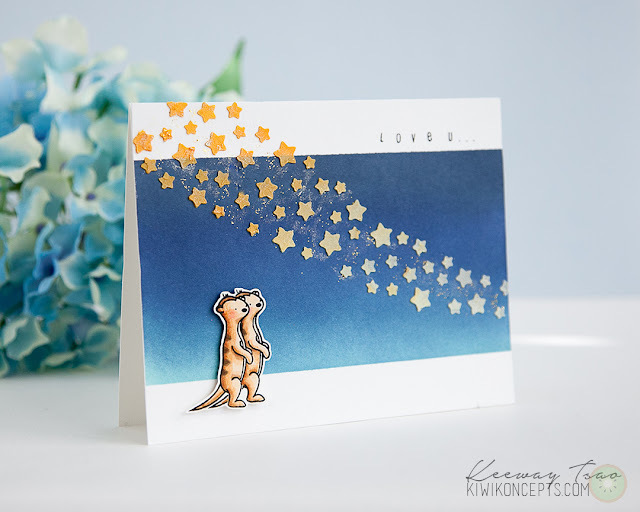 Please give her a warm welcome and more than that - hop over to her Blog Kiwi Koncepts - take time to look at all her amazing designs and sign up for her creations - you are sure going to love them! When I see beautiful products, I like to let it inspire me to create scenes that I can imagine myself in. 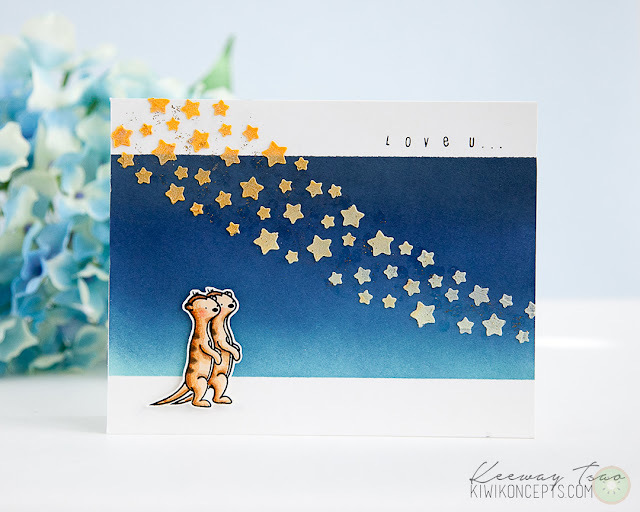 In today's card, the wave of stars stencil is what caught my attention and when I imagine a beautiful sky sprinkled with stars, I would want to spend it with someone special. - Mask off approximately an inch of the top and bottom of your A2 white cardstock with post-it tape. - Use your blender tool to create a gradient night sky, starting with your lightest color. In this card, I used Distress Inks and started with the Tumbled Glass from bottom up, then Chipped Sapphire from top to bottom, and then a touch of Hickory Smoke on the top. Blend until the colors gradually transition into each other. - Create two mixtures of embossing paste, one yellow and one orange. I used Distress Inks Squeezed Lemonade and Spiced Marmalade. 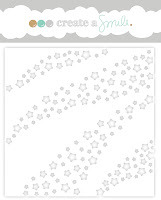 - Place the Wave or Stars Stencil where the stars to be, and spread the yellow embossing paste right to left. Then spread the orange embossing paste left to right. The colors will mix somewhere in the middle. Let it dry. - Stamp the meerkat from the Friends and Couples set once on cardstock, and another time on a separate piece of paper to create a mask. After you mask the first meerkat, you can stamp the second one beside it. Color in with copics. You can also add a hint of color pencil to create additional texture and shading. Then, cut out. - To create an extra sparkle on your stars, add a hint of gold glitter. I used a Q-tip to help me add a thin and scattered layer of clear glue to add some gold glitter to my stars. I also went over the embossed stars more with my Wink of Stella pen. 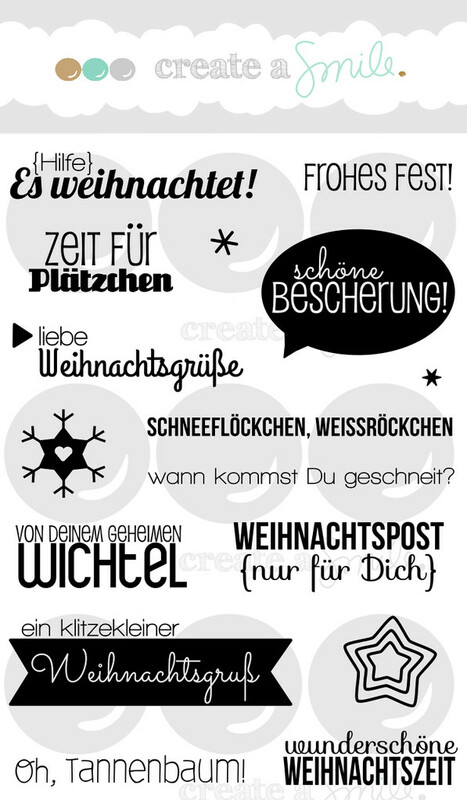 - Stamp your sentiment in the top right corner of the card. - And lastly, use foam tape to adhere the meerkats underneath the stars. Be patient. When playing with embossing paste, it can take awhile to dry, but if you are able to set your project aside and come back to it next day, you'll have beautiful results and less chance of messing up your work. I have to remind myself that all the time. You'll get to see more of her creations this week-end - so make sure to check back! 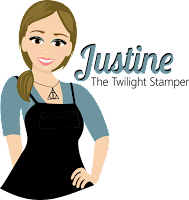 Justine here again with another video tutorial - this time a bit different. Have you ever had a creative slump or a time where you just didn't have any ideas for cardmaking. Well I am going through that now and I wanted to share with you my "go-to card technique" for when I am just not feeling very crafty. I wanted to share my quick, easy technique for stunning cards every time without having to be super creative. Over on my blog, I shared my favourite stencils, stamps and ink combination for this technique so be sure to come visit and say hi! In my video, I show you how to do my go-to card and talk about my recent creative low-point. There are some clearance stamps available over at Create a Smile so snap them up before they are gone! Hi there it's Anja again on this monday at the beginning of a new week. I don't know about you but sometimes I really have no idea what card to make. I sit down and just start and look where it will lead me. So for this card I started with a white panel and stamped those leaves randomly on the card. I wanted to highlight the right area without using coloring so i embossed the dies for some extra interest. From there on the card was build up just by experimenting. I think I am satisfied how it turned out at the end. As I mentioned before I started with a white panel and randomly stamped the leaves. I used a grey memento ink because I first wanted to color the images. I decided to leave them blank and highlight the area by embossing with the magical frames die. I stamped some flowers on vellum and white heat embossed them. Did some fuzzy cutting and arranged them onto the card. The sentiment was white heat embossed onto some red cardstock and placed upon the arranged flowers. Placed some white embroidery thread behind the flowers for some extra interest. Adhered some clear droplets ad random and finished the panel. I wanted a bit more color and decided to use the colors of the panel with strips of red and dark grey cardstock. Placed it all onto a topfolded white cardbase and thus finished my card. Botanical Love and Magical Flowers. When you have no idea which card to make just sit down and start stamping a background with a small image and see where it leads you. often you get the idea by just playing with your supplies and trying new things. To pull a card together try to bring back the colors in your card by using strips of paper or just a little accent in the colors of your card. We love to see your creations so place them in the sidebar. Pretty in Pink Monster Hugs! Experimenting With Colours II - Rainbow!